What do you do when a natural disaster takes out your library? You go mobile. 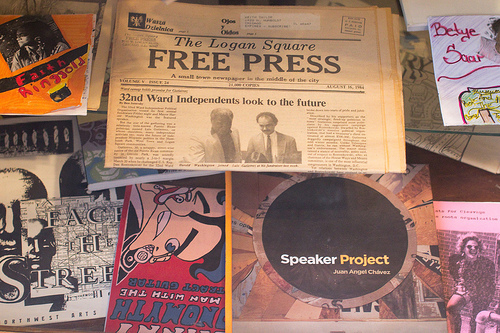 The Chicago Underground Library, an organization dedicated to the collection and distribution of local independent and small-press media, is nothing if not about adaptation created by necessity. This principle is reflected in their mission statement and most recently, in the pop-up library project that sprung in part from a blizzard burying a sizable portion of their publications. Turning a potential pitfall into a chance for evaluation and reinvention, they're currently collaborating with spaces across Chicago to house their collection -- Albany Park's North Branch Projects, Uptown's Chicago Grassroots Curriculum Taskforce, and recently Logan Square's Comfort Station. Co-founder Nell Taylor explained the library's recent developments, both tangible and online, and shed some light on the mentality that keeps the CUL alive in an age where the nature of libraries, media, and public spaces is ever-shifting. 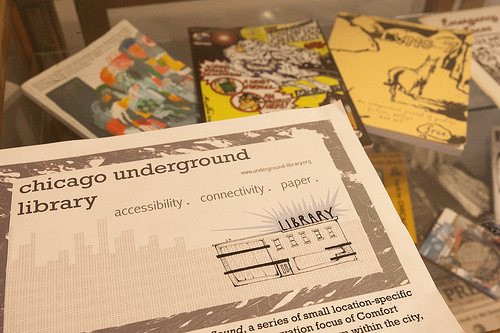 Want to help the Chicago Underground Library find a home? 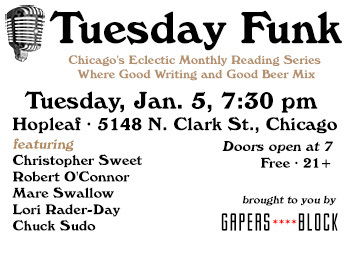 They're holding a benefit for that tonight at Beauty Bar (1444 W. Chicago Ave.) from 9pm to 2am. 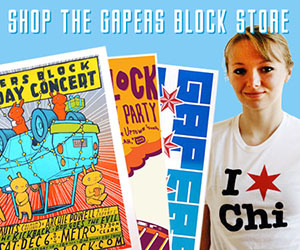 Gapers Block: How did you become involved with Comfort Station? Nell Taylor: Josh Dumas, a really wonderful performer and artist and musician, had emailed me and said hey, my friend David Keel was just put in charge of Comfort Station, have you heard about it, you guys should do something there. I know Josh because Josh showed up at our very, very, very first meeting at Mercury Cafe back in 2006, with a whole bunch of stuff for the library. So it's all kind of coming full-circle now. He put me in touch with David and Jess [Devereaux]...I went over there and told them about what was going on with us, and that we were looking to do this whole series of pop-up libraries. We didn't know how long it would be before we could find a space, and with each one of these, we're doing it kind of tailored to what our partner's already working with. GB: How are you doing that? What are some of your other partners? 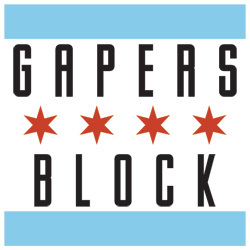 NT: Another one is the Chicago Grassroots Curriculum Taskforce, which is in Uptown -- they're a group of educators who are working to build very Chicago-specific, diverse, more representative curriculum for city students to use in the classrooms. They have this really wonderful collection. 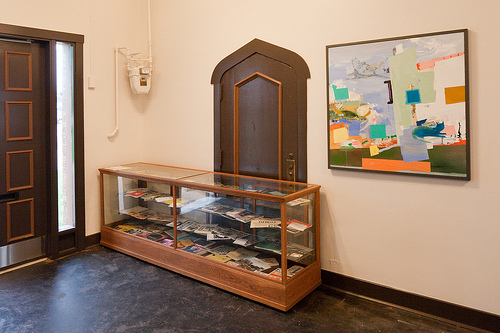 The pop-up library's a combination of our materials and theirs -- we made that one specifically around urban renewal and gentrification because that's one of their core curriculum tracts. Besides having this really cool use of the two collections, that's where we've kept up doing cataloging every Tuesday. So when we lost our space, Dave Rader, our cataloging manager, was so determined that everything was going to continue completely as normal that he would go and take a ton of books or magazines, stick them on the back of his bike, and ride to a coffee shop every Tuesday and keep cataloging going. GB: He wasn't going to let it stop. NT: No. And we wanted to get the pop-up libraries going sooner, but it's sort of the nature of working with other small groups, where even getting things up in a two-month period is a huge accomplishment. Everyone is under-resourced. It works great when we can all work together, but we've just been trying to keep moving forward....we launched our catalog a week after the blizzard blew in, we were at the Code for Libraries conference [code4lib] in Bloomington, Indiana. We were recovering from that, and meanwhile we're taking the catalog on the road and showing it at the conference. The speaker used our logo in his slide about what was going to save libraries. It was really inspiring, because I could not have been feeling worse at that moment. GB: What happened, exactly, with the blizzard? NT: We were in this beautiful 100-year-old church parish house on the second floor. NT: Belmont and Broadway. We were so excited when we first moved in there, were like oh my God, this looks like a library, because it had the stained-glass windows, and the chandeliers, and all that stuff, it was gorgeous. But one of those windows...when the blizzard hit, they just had these little latches, and we thought that they were all tight. So we got the call the next morning after the blizzard from the director of the theater company who we shared a space with, and he said you guys need to send someone over, one of the windows blew open and your zine rack's in a snowbank. And it was so bad that when I got there at 1pm in the afternoon, it was still in the snowbank, still frozen. It took me a couple of hours to get down there, Emerson went with me, my parents drove all the way in from Oak Park. No one could drive anywhere. Our volunteers with cars couldn't get their cars out of their garages. Meredith Carey, who's our blog editor, came down from Bucktown on the bus and met us down there a couple of hours later. Both of us just showed up with tote bags full of hair dryers and towels. We had no idea at all what we were going to find. For as bad as it was, we're so lucky in some ways that it hit the zines, because if it had hit the magazines or the books, we would've had all these different coatings on the books and on the magazines...the different UV coatings that would melt and make everything stick together, versus the zines where it was mostly all uncoated, so the paper, while wrinkly, dried out and nothing was stuck together. So we were there...Meredith and I are two of the non-archivists, two of the non-librarians in the group...we had people who were trained in this who were stranded at their homes in Jefferson Park or wherever they were, calling in and giving us instructions. They were like no no no, don't blow-dry them, hang them. Get them up on strings. GB: That's a really quick response. Also, this is really good to know when I drop a book in the bathtub. Because it's going to happen again. NT: That part was fascinating, because our first instinct had been to blow-dry them, but that was going to wrinkle them more. Since all of our shelves at that point were mostly these wire baker's racks kind of things, we laid out all the zines over the different wires and tried to separate out what we could, the ones that were really, really bad, and in the end I think we probably only lost a couple. 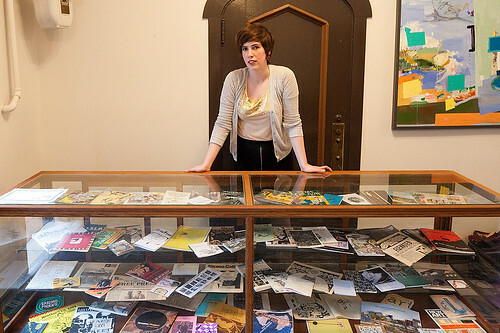 Zines, books, newspapers and more: a sample of the collection. GB: Do you think you want to do another round of pop-up libraries? NT: Absolutely, this is something that we'll keep doing for sure, even when we have a regular location. Whether we do the backpack ones, which I still love -- being flexible enough to do that, especially too because there's so many people in the city who don't have the....whether or not they even have the funds is beside the point, they don't even have the privilege to travel freely between neighborhoods. If our volunteers do and we can send people to go into schools or places where people can come, we're excited to do that. It's really cool for us to still have the central location. In our strategic meeting, some people were like well, what if you guys just went completely digital? I still firmly believe in the idea of the library as a community center, so I feel like people who are saying that libraries that are only books, and books are obsolete so you don't need the libraries anymore are completely missing the entire point of having a space that brings people together for common civic discourse. It drives me nuts. They've never taken advantage of what's there, oftentimes because they've never needed to -- the meeting space that they provide, the opportunity for people to connect. We always envisioned our library as being kind of a meeting space and co-working space where people could come and just meet with like-minded people, but also get introduced to people who they'd never, ever meet in their lives. GB: How is this library unique to Chicago? NT: Well, so no one else has anything like this. That's what's really exciting about it, that's one of the things that we're working on with Drupal. We're also trying to figure out, can we get a system going that's kind of a sandbox for other developers to play in and build this into its own self-contained system. Anyone who wants to start one of these in their own city can just go ahead and download the catalog, and then they have the theoretical and the technical template ready to go. There's already, and I'm not going to name names, a demand from a handful of organizations within the city who want to make use of our software. We're trying to figure out now, what can we do for them. When I was over at Grassroots Curriculum Taskforce, they had an organizer visiting from Cairo, Egypt who gave me his card and said, I want to see this in Cairo, tell me when you have the software ready. It's really cool to think about how you can spin this out to work with different cultures, with open source software and then by saying it's not going to be a top-down thing, we're not going to have the centrally located underground library system that dictates the way you run all your programs. We'll give you the software, we'll give you the template, we'll tell you to be inclusive and to do all this kind of mapping and focus on the social connections. But then it gives you the freedom to autonomously decide how you want to run your programs. What works best for your city, and for the media culture that you're working in. That's something you can do in the actual, physical side, the in the street programs, and on the programming side too. All photos by David Schalliol.